This gentleman won't bite but it could do with some new blood. This cool graphic tee is a cool tee to wear when you go drinking. Get this cool graphic tee now! 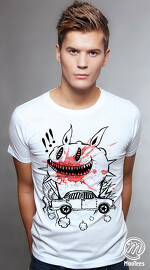 Graphic tee design : A skull with fangs, a bow tie, a small hat and words inscribed on its head.